Billy & Judy – Our experience with Cory and Cardinal Lawnscapes has been great! We asked Cory to design our patio to enhance our new Sunroom. We had no clue as to what we wanted. When Cory came back with the drawing, it was a perfect complement to our Sunroom. Cory has a God given gift of knowing exactly what a plan is going to look like before the first shovel of dirt is moved. We’re very pleased with the quality of work he did and the timely manner in which the job was completed. 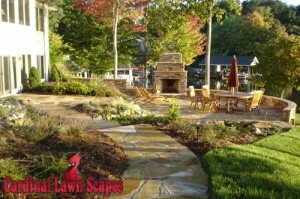 We would recommend Cardinal Lawnscapes to do your next Patio. Beth – Working with Cory Snow and family of Cardinal Lawnscapes has been a great experience for us. 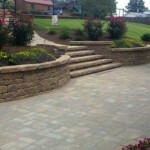 Several years ago, Cory helped us transform our vision into a beautiful oasis in our backyard at Smith Mountain Lake. We have hosted numerous events and guests on our patio and our outdoor living area continues to “wow” our friends and family. Cory is dependable, creative and stands by his work. The building process went smoothly and the outcome has been fantastic.